Who invented Santa Claus? No specific person has ever been credited with the invention of Santa Claus but the legend of the famous, fictional character derives from the real life of a Greek Bishop called Nikolaos of Myra who became known as Saint Nicholas (c. 270 - 346AD). Who invented Santa Claus? Sinterklaas: In the Netherlands the Feast of Sinterklaas celebrates the life of Saint Nicholas and Dutch immigrants to the New World brought their tradition to America where the word 'Sinterklaas' developed into the name of Santa Claus. Who invented Santa Claus? Father Christmas: The personification of Santa Claus was also influenced by the English character of 'Father Christmas' who emerged during the Protestant Reformation. English colonists took the legend and traditions surrounding 'Father Christmas' to America which merged with 'Sinterklaas' customs to create the American Santa Claus. Who invented Santa Claus? Coca Cola: The Coca Cola company did not invent Santa Claus but were responsible for repackaging the modern Santa Clause image. Definition of Santa Claus: Santa Claus is defined as a modern mythical figure of Western Christian culture, based on the gift-giving legend surrounding Saint Nicholas. Santa Claus is said to bring gifts to the homes of well-behaved children on Christmas Eve (24 December). Santa Claus is depicted as a portly, jolly man in a red costume who delivers presents riding on an air-borne sleigh pulled by reindeer. Fact 1: Who invented Santa Claus? The fictional character of Santa Claus is based events that occurred during the real life of Saint Nicholas, the celebration of the Feast of St. Nicholas (known as Sinterklaas in Holland) and the personification of 'Father Christmas', or 'Old Man Christmas'. Fact 2: Who invented Santa Claus? The traditions relating to Santa Claus also resonate with the Pagan customs of the Ancient Roman festivals of Saturnalia, Sol Invictus, the Viking Yuletide and Celtic rituals. For additional info refer to the History of Christmas. Fact 3: Who invented Santa Claus? The personification of Santa Claus has emerged over many years as part saint, part pagan, part fiction and part advertising executive's creation at Coca Cola. 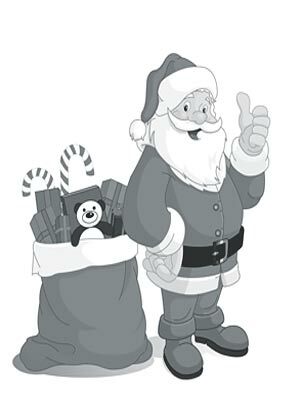 This article tells the story of the famous character, Santa Claus. Fact 4: Who invented Santa Claus? The kindly traits of Santa Claus were based on the life of the Greek Bishop, Nikolaos of Myra (c. 270 - 346AD), who became known as Saint Nicholas. Saint Nicholas who was born c. 270 in Patara, Lycia, Turkey and died on December 6, 346 and was known for his generosity, gift-giving and his kindness to children. Fact 5: Who invented Santa Claus? The Feast of Sinterklaas, or St. Nicholas, was enthusiastically celebrated by the Dutch on December 6. The early Dutch colonists continued to celebrate the Feast of St. Nicholas and the Sinterklaas traditions to America where the word 'Sinterklaas' gradually changed to "Sinter Klass" and then into the name of "Santa Claus". Fact 6: Who invented Santa Claus? The personification of Santa Claus was also influenced by the English character of 'Father Christmas' or 'Old Man Christmas' who emerged during the Protestant Reformation that banned the veneration of Catholic saints and eliminated the Feast Day of Saint Nicholas. Father Christmas was portrayed as a large man who wore a scarlet robe lined with fur and a crown of holly or mistletoe. Fact 7: Who invented Santa Claus? Protestant German immigrants to the New World introduced 'Christkind', aka Christkindlein or Christkindl, meaning "Christ-child" as the traditional Christmas gift-bringer. The word Christkindl became known as "Kriss-kingle" and eventually "Kriss Kringle" who remained the most the common bearer of Christmas gifts in Pennsylvania until the early 20th century. Fact 8: Who invented Santa Claus? The idea of Santa Claus became deep rooted in the human psyche and legends and myths surrounding the character began to grow as authors began to write stories about the character. In 1812 the American author Washington Irving (1783 – 1859) wrote 'A History of New York' in which he described a dream sequence which featured St. Nicholas soaring over treetops in a flying wagon. Fact 9: Who invented Santa Claus? The modern traditions associated with the Dutch Sinterklaas originated from the illustrated children's book ‘Sint Nicolaas en zijn knecht’ (Saint Nicholas and his helper) which was written in 1850 by a schoolteacher named Jan Schenkman (1806–1863). Fact 10: Who invented Santa Claus? The Dutch legend involved children leaving their shoes near the fireplace at night and filling them with hay and carrots for Sinterklaas's flying, dapple grey horse called Amerigo. His helpers, called the Pieten, delivered the children's presents through the chimneys of the houses. Fact 11: Who invented Santa Claus? In 1822 Clement Clarke Moore wrote the famous poem "A Visit from St. Nicholas" also known today by its opening line "T'was the night before Christmas" in which he described 'St. Nick' as a "little old driver" riding a "miniature sleigh". Fact 12: Who invented Santa Claus? George P. Webster wrote the poem 'Santa Claus and his Works' inspired a cartoonist called Thomas Nast to create pictures of Santa Claus that are very similar to the modern day image of the character. George P. Webster firmly established Santa Claus as a maker of toys and identified the North Pole as his home. Fact 13: Who invented Santa Claus? During the 19th century Santa Claus was often shown wearing coats of different colors including purple, green and blue, as well as red. This changed when an illustrator named Haddon H. Sundblom (1899 - 1976) started working for the Coca-Cola company. In 1931 "Sunny" Sundblom produced the first picture of Santa Claus in a red coat that would be reproduced in subsequent Coca-Cola Christmas advertising campaigns. Fact 14: Who invented Santa Claus? The enduring image of a merry, kind, old man with rosy cheeks, twinkling eyes and a red coat is the Santa Claus that children now believe in. Who Invented Santa Claus? - Definition - Meaning - Famous - Santa Claus - First - Definition - Kids - Facts - History - Timeline - Santa Claus Information - Info - Who invented Santa Claus - Dates - When - Why - Impact - New - Old - Definition - Meaning - Santa Claus History - Awesome - Cool - America - Who invented Santa Claus?